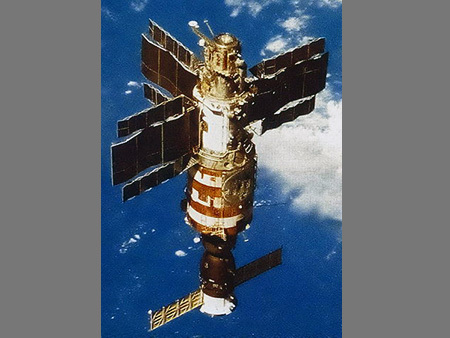 In July 1984, Russian cosmonauts aboard the Sovie space station Salyut 7 were on day 155 of their mission. This was also the day that the group reported strange lights and beings. According to commander Oleg Atkov and cosmonauts Vladmir Solovyov and Leonid Kizim, the space station was completely bathed in a mesmerizing orange light. It appeared to enter from outside the space station and bled through an absolutely opaque wall. For a short period of time, the orange light was so bright that it blinded the crew. When their vision returned, each one looked out the portholes for the source of the light, looking specifically for a possible explosion. They knew the Salyut 7 had suffered previous fires, but what the crew saw was more incomprehensible than the orange light. 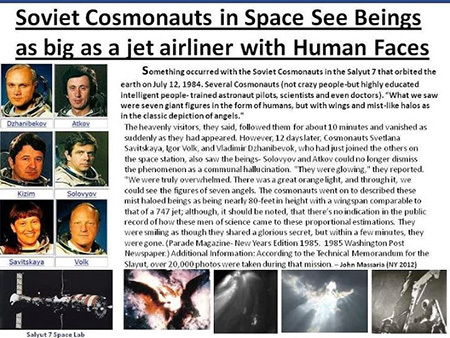 All of the cosmonauts reported seeing the faces of seven angels who were hovering just outside the space station. They told ground control they were humanoid in appearance (faces and bodies looked human), but they had wings and halos. 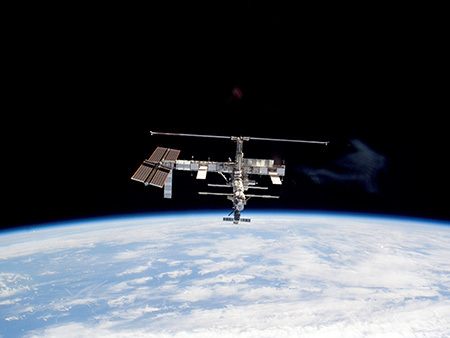 These beings kept pace with the space station for 10-minutes before vanishing. On day 167, the crew was then joined by another team of three from the Soyuz T-12 spacecraft: Svetlana Savitskaya, Igor Volk and Vladimir Dzhanibekov. Shortly after joining then, the Salyut 7 was once again bathed in a warm orange light. Then, like clockwork, they immediately looked out the portholes, and once again, were joined by angelic beings. They were reportedly the size of an “airliner”, according to the cosmonauts. This incident was deemed top secret by the old Soviet Union and the crew was cautioned not to speak of the event publicly. 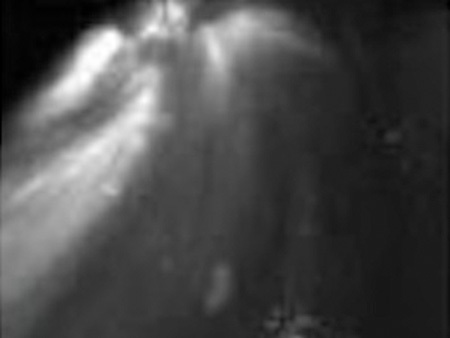 All the cosmonauts reported seeing “a smiling angel”. While some may dismiss the incident as fatigue due to an extended stay in space, but there was more than one crew that saw the beings. After this strange incident occurred, the crew went on to stay in the vessel for a record-breaking 237-days before abandoning it.